There is a new shortcut to Ojibway's web site. Instead of trying to remember our URL just tell your friends to enter www.ojibway.ca to reach our site. Recent additions to our web site include new spider images, a new page on the Bugs of Ojibway and new photo gallery of the Ojibway Prairie Complex. Why do leaves change colour in the fall? Scientific American has an article that explores this question on their web site. Click here to go to the article. Tuesday, October 29: The past two weeks have been unseasonably cool with several nights of light frost. Fall colours were late in arriving this month and it has only been over the past week that species such as Sassafras, Pignut Hickory and Red Maple reached their peak colour. Banders at Holiday Beach captured 25 Northern Saw-whet Owls on the night of October 27 so this is a good period to look for these diminutive owls. Saturday, October 12: A few Northern True Katydids were still calling tonight. This will mark the end of the calling period for this insect. Sunday, October 6: Fungi are not as plentiful in the park as last fall due to the drought this summer. We did find sufficient numbers of mushrooms on today's walk to keep us busy identifying our discoveries. Fallen logs that still retained their bark supported Chicken of the Woods Laetiporum sulphureus, Turkey-tails Trametes versicolor, Purple-toothed Polypores Trichaptum biformis, False Turkey-tail Stereum ostea, and Polyporus mori. A young Hen of the Woods Grifola frondosa, was found growing on uprooted oak roots. Old rotten logs held Pear-shaped Puffballs Lycoperdon pyriforme, Bay-brown Polypore Polyporus badius, "shoe strings" of the Honey Mushroom Armillaria mellea, tiny disk fungi and numerous LBMs (little brown mushrooms). Pear-shaped Puffballs were also found growing in the wood chips used to line the Pin Oak Trail. Other discoveries along park trails included Collared Earthstars Geastrum triplex, an emerging Two-coloured Bolete Boletus bicolor, Poison Paxillus Paxillus involutus, Shaggy Mane Coprinus comatus, Japanese Parasol Coprinus plicatilisand a small white Volvariella (an Amanita look-alike) Volvariella pusilla. Park squirrels have developed a taste for Emerald Ash Borer larvae. 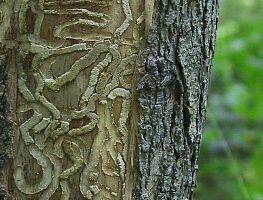 Hundreds of ash trees at Ojibway show signs of damage where squirrels have chewed off the bark to expose the larvae. Wednesday, October 2: The hot September weather has continued into October with a record high temperature of 29C yesterday (84F). Mary Montsch found two Yellow-bellied Sapsucksers by Ojibway's pond on Tuesday. 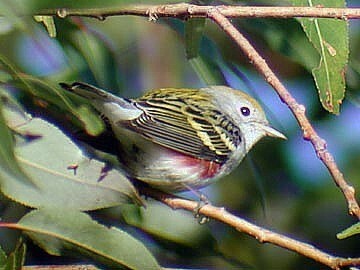 Good numbers of migrant birds are present in the park today. Fred Urie recorded 13 species of warbler, Scarlet Tanager and Eastern Wood Pewee between Ojibway Park and Spring Garden this morning. White-throated Sparrows (15), Yellow-rumped Warblers (32) and American Robins (125) have become more common over the past week. Copyright � 1999. All rights reserved. You are on a City of Windsor Web Site.